Carl Linnaeus document signed, acknowledging receipt of his salary as Professor of Medicine and Botany at the Royal Swedish Academy. 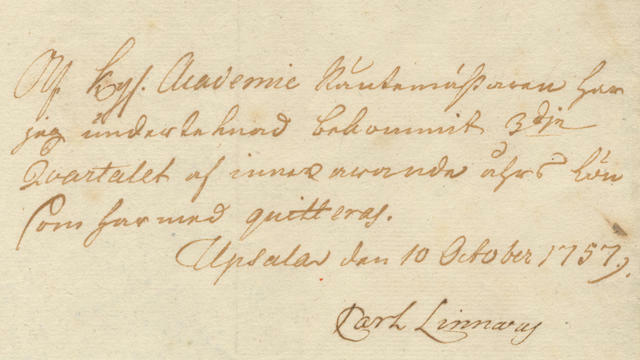 Datelined Uppsala, 10 October 1757 in Swedish, elegantly signed ''Carl Linnaeus''. Named the ''Father of Modern Taxonomy'' and the ''Prince of Botanists'', Linnaeus was one of the most renowned scientists and naturalists of his day, having published ''Systema Naturae'' in 1735, which classified 4,400 animal species and 7,700 plant species. The publication was so important that people from all over the world sent their specimens to be included in subsequent editions, which reached its 12th edition in the second half of the 17th century. Document measures 8'' x 4''. Mounting remnant to verso and vertical fold, otherwise near fine condition. Auction closed on Thursday, April 26, 2018.